Will Haiti make one of its last unspoiled islands a tourist hot spot? Is This Tiny Island the Key to Restoring Haitian Tourism? Residents aren’t so sure they want to find out. Each week, Roads & Kingdoms and Slate publish a new dispatch from around the globe. For more foreign correspondence mixed with food, war, travel, and photography, visit their online magazine or follow @roadskingdoms on Twitter. Haiti’s mango season is short but famously abundant. With thin yellow skin and juicy, fragrant saffron flesh, the indigenous variety Francis ranks among the world’s finest and is the country’s second-largest export. In the heart of remote Ile-à-Vache, an island off Haiti’s southern coast, you’ll hear the fruit drop from branches. Hauled by mules, dinghies, and hand-painted trucks along bumpy roads, some eventually reach Port-au-Prince and beyond. Bruised and battered, a third are rejected on arrival, and less than a tenth leave the country to sell for $5 at upscale American supermarkets. If the government has its way, the mango trees will soon yield to golf courses, swimming pools, and other trappings of high-end resorts. Ile-à-Vache has been deemed the perfect place to become the next big thing in Caribbean tourism, revitalizing a crucial Haitian industry. It’s a 13-kilometer drop-shaped island with pastel-painted, straw-thatched houses, hills grazed by goats and cows, and more than 20 beaches. The lagoon is fringed by mangroves, and its shores are sprinkled with coral reefs, shipwrecks, and legends of sunken treasures. Centuries ago, this was the base of Captain Henry Morgan’s buccaneering ventures. Later, during the Belle Epoque, Haiti—La Perle des Antilles—was the place to be. Socialites, bohemians, artists arrived on cruise ships, fawning over Port-au-Prince’s beautiful architecture, drinking rhum punch in its jazz clubs, and sunbathing under palm trees at the Caribbean’s second-longest coastline. Until the turmoil under the Duvaliers in the 1980s, and an HIV epidemic that virtually killed it overnight, Haiti’s tourism industry was golden. Reviving the sector makes perfect sense: Tourism is seen as both a silver bullet solution to Haiti’s perpetually underperforming economy and an alternative to an ever more hopeless aid complex. The idea that tourism could drive Haiti’s recovery from the devastating 2010 earthquake started as a one-woman show, under the charismatic leadership of Stéphanie Villedrouin, who became tourism minister in 2011 (she was replaced by Guy Didier Hyppolite in March). She pitched Haiti as the final frontier of Caribbean paradise. A weary kompa band was hired to perform at arrivals at Port-au-Prince’s airport, which still lacks a control tower, and resort mega-projects were initiated across the country, with Ile-à-Vache as the flagship. Miami and New York are only hours away, the coastline is just as lovely as the neighboring Dominican Republic’s, and who could resist Haiti’s vibrant culture, Creole cuisine, and colonial history? Capitalizing on all that, Villedrouin wanted first to lure the vast diaspora—1 in 8 Haitians live abroad—then everyone else. amid renewed political protests and with elections initially scheduled for April 24 postponed yet again—Haiti’s promises of a tourism renaissance seems to be more uncertain than ever. Ile-­à-Vache, the 13-kilometer island off Haiti’s southern coast, is advertised as the last untouched corner of the Caribbean by the country’s Tourism Ministry. It was a proven model. When Labadee, a semisovereign cruise resort, opened in 1986, tens of thousands foreign tourists visited the peninsula, which was pragmatically sold as “Hispaniola,” without ever knowing they were in Haiti. With virtually no competition, Labadee became Haiti’s most popular tourist attraction, funneling millions of dollars into government coffers every year. It’s less a struggle against tourism than one against the government’s version of it, emphasized schoolteacher Kenold, who was born and raised on the island and is a consultant for the pacifist resistance group Konbit Peyizan Ilavach, or KOPI (the Organization of Ile-à-Vache Farmers), which has pledged to fight on behalf of Ile-à-Vache’s 14,000 residents. Kenold said KOPI’s leader spent 10 months in prison, probably because of his opposition to the development; and another member died in a suspicious motorcycle accident. Was that the tropical dream the regime had in mind? Seated in the shade of a parasol next to the swimming pool of one of his luxury hotels in Port-au-Prince, James Boulos Laham, an investor from one of Haiti’s old bourgeoisie families, said the islanders needed to see the long-term benefits. * As skeptics dismiss Ile-à-Vache as a playground for the nation’s elite, Lamal, fed up with the idea of Haiti as a place to be “saved,” was positive that tourism was a viable alternative to aid handouts. Tourism meant improved infrastructure, efficient agriculture, and political stability. And it’d be far better than sweatshops. An excavator sat triumphantly on a sand mound where Yves Laguer’s house used to stand. Behind it, a dredging ship obscured the horizon. Like every other market day, dozens of people huddled together in hand-painted vessels with names like “Jesus Is Boss” or “Bondye” (the Good God). To traverse the strait to the mainland, tarps were pulled over them to protect from sunshine and seawater during the 40-minute journey. This is the daily commute for many of the island’s residents: When they buy or sell produce at the market or even just top up their phones, they have to go across the strait to Les Cayes and they can only get there by boat. Most use the public (and overcrowded) boats, unless they own one like Laguer does. 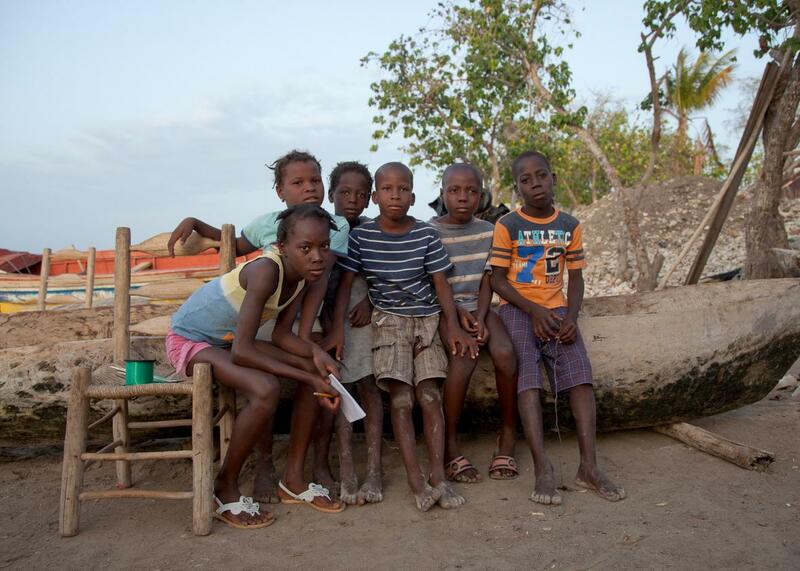 Children pose for a photo on Ile-à-Vache. Laguer, who lost his home shortly after a 2013 presidential decree declared the land a “zone of public utility,” tried to stay optimistic. Born and raised on these shores, he had always been a fisherman, and being relocated from the beach to Ile-à-Vache’s mountains with his wife and 12 children wouldn’t change that. He comes down from the hills every morning at dawn to head out at sea. Life has certainly become more difficult since the development begun. It has never been clear who owns what in Haiti. Land ownership divided the republic from its inception: Farmers assumed the land liberated from the French would be theirs to keep, and the revolutionary elite insisted on state-led distribution. Over the years and the anarchy of various dictatorships, a legacy unfolded of those with money and power grabbing what they desired. Today, Haiti’s land registry accounts for about 5 percent of its landmass, and many records were destroyed during the devastating 2010 earthquake, leaving many unresolved disputes. Ile-à-Vache’s new runway has already been scaled back several times. Yet, Geronimo Ruiz, a Dominican developer contracted by Haiti’s government, was hopeful as he surveyed the empty site of a planned terminal. * Tourism has long been the dominant export for his own country. When, or perhaps if, completed, he was certain Ile-à-Vache could easily compete with the Dominican Republic’s Punta Cana. 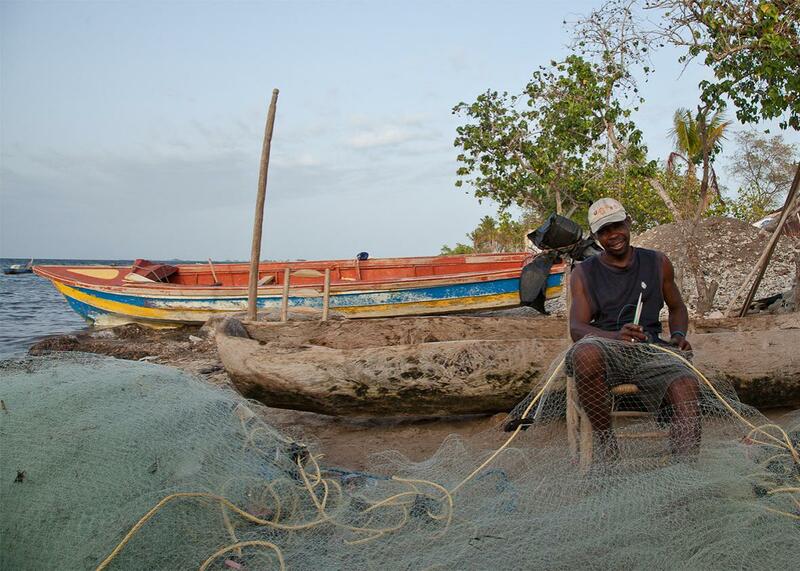 For now, Ile-à-Vache remains warped in time without running water or electricity. At night, under the full moon and the faint bluish light of a solar torch, the dancing grew fiercer. The musicians—flutes, maracas, drums—closed their eyes and swayed with the rhythms as they stepped up the pace. Almost 100 islanders formed a circle around them; singing, clapping, and dancing, fuelled by endless bottles of moonshine and local beer. The music echoed to the next village. Here, the magic of Voodoo was alive and well: Far removed from horror movie clichés, Haiti’s legendary religion resembled dancehall more than Hollywood tropes. Young women possessed, in denim shorts, tank tops, and bold makeup, swirled ferociously. Gazes fixed in the distance, or perhaps on a transcendent point in space and time, their bodies trembled with naked feet furiously stomping the dust. Their skin glowed with sweat, and when the music stopped momentarily, spectators passed them towels as they stumbled off the floor. His island was yet to be connected to the grid, and with only one clinic for 14,000 residents, Sisius was a spiritual leader, doctor, and midwife—who just happened to throw the island’s best parties. Now Ile-à-Vache’s isolation was about to end: Construction sites had already mushroomed, fruit groves were bulldozed, and there was a new hospital coming, courtesy of the Tourism Ministry. There are no power plants on the island so the hospital would run on generators. 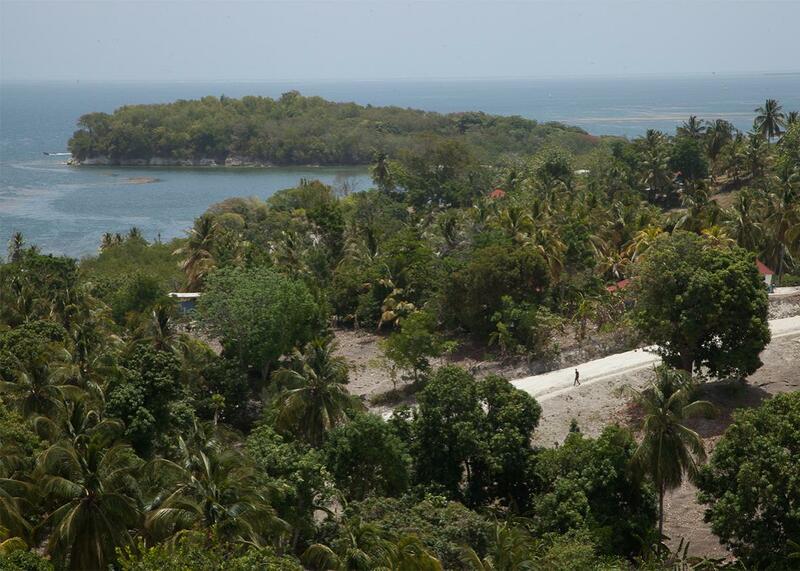 “The government of Haiti is moving closer to fulfilling its vision of transforming Ile a Vache into one of the most beautiful tourism destinations in the Caribbean,” the tourism minister had promised, though it had sounded more like a threat. “At the same time, it is raising the quality of life of the island’s men, women, and children.” For virtually all of Haiti’s neighbors, tourism had boomed into a $1 billion industry, but as the islanders danced until the break of dawn, they weren’t so sure they wanted things to change. Reporting for this story was supported by the European Journalism Centre.